This short documentary video introduces the history and techniques of Ssireum, a traditional style of Korean wrestling. Filmed in Korea. Watch more Ssireum videos on our Youtube Channel. This is the Translator's Preface from the English language translation of the Muye Dobo Tongji: Comprehensive Illustrated Manual of Martial Arts of Ancient Korea followed by selected excerpts from the original text. 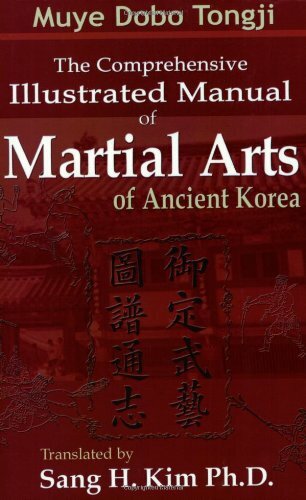 This book is an ancient Korean martial arts manual, written by Yi Duk-moo, Park Je-ga and Pak Dong-soo in 1790, under the order of King Jungjo. This premiere English translation of the manual is the result of nearly a decade of planning and work. According to historic documents, archery was the only official martial art that had been practiced by the soldiers of Chosun (ancient name of Korea used during the Yi Dynasty, 1392-1910). Considering the fact that yangban (aristocratic class) literati dominated the political, economical, and cultural life during this period, it is not surprising that practice of martial arts was looked downed upon and generally discouraged. After the Japanese invasion (1592-1598), King Sunjo (1567-1608) acquired a Chinese martial arts manual called Kihyo Shinsu written by Chuk Kye-kwang of the Ming Dynasty. He took a personal interest in the arts and subsequently invited the Ming military officers for a demonstration of their fighting methods. The king ordered his military officer Han Kyo to compile six fighting methods for further study. Han Kyo documented the kon bang (long stick), dung pae (shield art), nang sun (multiple tip bamboo spear), jang chang (long spear), dang pa (triple tip spear), and ssang soo do (long sword) which he published collectively under the title Muye Jebo (Martial Arts Illustrations). Following this period, the first Manchu invasion took place in 1627 (called Chungmyo Horan) and the second invasion in 1636 (called Byungja Horan). King Injo (1623-1649) surrendered to the Manchus and his two sons, including the Crown Prince Sohyun, had to accompany the Manchu army as hostages. In this short video, Korean archery masters discuss the 4 principles of Korean Traditional Archery (Kuk Kung, Gong Sul or Goong Do). Watch more at Youtube in this series of documentary videos on the history, practice and customs of Traditional Korean Archery (also known as kuk kung and gongsul). Filmed in Korea with some of the highest ranking and best Traditional Korean archery masters in the country. Kwon Bup means fist fighting method in Korean. The earliest surviving written reference to kwon bup is found in the Muye Dobo Tongji, which has extensive documentation on the techniques and history of kwon bup. According to this text, kwon bup was impractical for large scale combat on the battlefield, but was taught as an introduction to the martial arts. Soldiers learned kwon bup prior to learning more complex weapons arts to master footwork and body control. It was also taught as a method of personal self-defense for Chosun warriors. According to legendary strategist Chuk Kye-kwang, ""Kwon bup is not adequate for large scale combat, however it is an excellent way for beginners to start martial arts training to learn the way of the hands and feet and discipline." Kwon bup was developed based on the methods of the Shaolin Temple and the techniques of Jang Song-kye. The Shaolin methods emphasized external style (waega) techniques including joint locks, jumping attacks and elaborate footwork. Advanced techniques of the Shaolin style were very elaborate and difficult to master. Jang Song-kye favored internal techniques (naega) with an emphasis on self-defense. His philosophy dictated that skills only be used when one encountered an unavoidable enemy or hopeless situation. According to the historical text Naega Kwon Bup, the internal style also included three classifications of vital death point attacks which were handed down in secret. It was widely believed, because of these secret techniques, that the internal style was superior to the external style in self-defense. An early master of naega style kwon bup, Wang Jung-nam devised thirty-five training methods and eighteen types of footwork. He classified them into yukro (six paths) and ship dankum (ten levels). The yuk ro methods were used to develop bone strength and inflict immediate damage while the ship dankum methods were intended to induce a delayed reaction. Many of his methods have been preserved in the Muye Dobo Tongji . A short documentary about the traditional Korean martial art of Taekkyon (Taekkyun) filmed in Korea at the Korean Folk Village in Yongin, South Korea. Demonstrations are by members of the Korea Taekkyon Association National Demonstration Team. Learn more about the techniques of Taekkyon in our full length Taekkyon video. Muye Eship Saban (Moo-yeah Ee-ship Sah-bahn), literally translated as 24 Technique Martial Art, is made up of the 24 arts of the Muye Dobo Tongji. In 1789, King Jungjo, ruler of the Yi dynasty, ordered General Yi Duk-moo to compile an official textbook on all martial art forms then present in Korea to preserve them for future generations. The result, the Muye Dobo Tongji, is the only surviving classical text on the Korean arts of war. Based on the earliest known Korean martial arts treatise, the Muye Chebo written in 1599, the Muye Dobo Tongji clearly shows the influence of the neighboring Japanese and Chinese armies. The jang chang is a five foot long spear made from the wood of the yew tree. It can also be made from a similarly soft wood, including bamboo in the right climate. It was considered the most effective conventional weapon on the battlefield due to its flexibility and length. The jang chang was widely used in the battle to retake Pyong-yang Fortress during the 1592 war between Chosun (Korea) and Japan.